pasta, originally uploaded by All Things Mimi. Bowtie pasta tossed with sundried tomato and regular pesto, toasted pine nuts, romano cheese and fresh ground black pepper, served with a piece of Dev's home made bread run under the broiler with a kiss of organic olive oil. 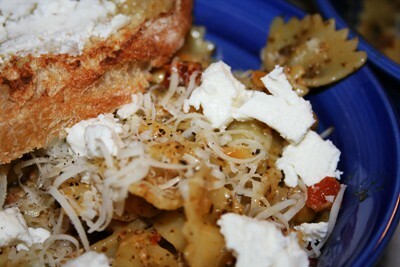 This was my bowl, so I added some goat cheese as well.